The Metatronic Keys Channels, Books and DVD Course are duly & legally International copyrighted & Trademark Registered: (TM®) Metatronic Keys, MerKiVa, MerKaVa, MerKaNa & MerKaRa : all rights reserved & copyright protected to Earth-Keeper. No use of this material is authorized without due written permission & acknowledgement from Earth-Keeper. 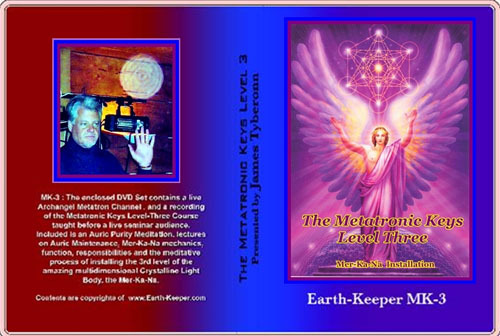 MK-3 : The enclosed DVD Set contains a live Archangel Metatron Channel , and a recording of the Metatronic Keys Level-Three Course taught before a live seminar audience. Included is an Auric Purity Meditation, lectures on Auric Maintenance, Mer-Ka-Na mechanics, function, responsibilities and the meditative process of installing the 3rd level of the amazing multidimensional Crystalline Light Body, the Mer-Ka-Na. DVD's are pre-checked and shipped in perfect functioning condition, in a sealed box set. Please note that the DVD's require a current, modern laptop or DVD player to work. DVD sets must be checked within 10 days of receival. No returns accepted after 10 days from receival date. USA orders please allow up to 3 weeks for delivery by standard post. Canadian and European shipping by standard mail please allow up to 6 weeks from date of shipping for delivery. Please note that receival times will vary according to customs process procedures in each country. Please email if you wish expedited Fedex courier shipping at an additional fee. Thank you !